Sometimes, a love story can be very good for the soul. 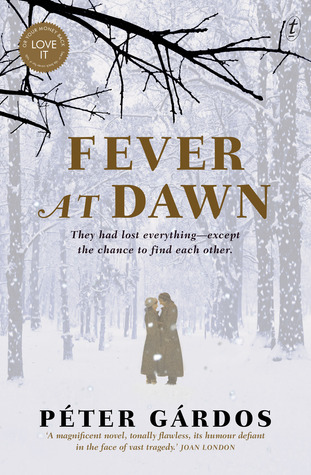 Fever at Dawn, drawn from the love letters of the author’s parents, is a triumph of the human spirit over adversity that is very satisfying reading. As a child, I had the rather naïve idea that the end of a war meant that the survivors could go home immediately, not knowing that POWs could continue to be held for months and years after an armistice, and that meant that their military guards weren’t demobbed. Occupation forces stayed in Germany for long after 1945 to manage deNazifiction; the Iron Curtain fell, trapping people behind Soviet borders; and in the case of the survivors of Nazi extermination and labour camps, the precarious state of their health meant that they were unable to go home, even if they still had homes to go to or countries willing to take them. Over 850,000 people remained in displaced persons camps for years after the war. My father, Miklós, sailed to Sweden on a rainy summer’s day three weeks after the Second World War ended. An angry north wind lashed the Baltic Sea into a three-metre swell, and he lay on the lower deck while the ship plunged and bucked. Around him, passengers clung desperately to their straw mattresses. They had been at sea for less than an hour when Miklós was taken ill. He began to cough up bloody foam, and then he started to wheeze so badly that he almost drowned out the waves pounding the hull. He was one of the more serious cases, parked in the front row right next to the swing door. Two sailors picked up his skeletal body and carried him into a nearby cabin. The doctor didn’t hesitate. There was no time for painkillers. Relying on luck to hit the right spot between two ribs, he stuck a large needle into my father’s chest. Half a litre of fluid drained from his lungs. When the aspirator arrived, the doctor swapped the needle for a plastic tube and siphoned off another litre and a half of mucus. Fever at Dawn could have been a grim tale, but it’s not. It’s poignant, but it’s also amusing and uplifting. For the parents of Péter Gárdos, Sweden became their refuge while doctors tried to save their broken lives, and Miklós, a Hungarian survivor of Belsen is determined to make a new life for himself. Given six months to live before TB kills him, he decides to write to 117 Hungarian girls in Swedish DP camps who are listed as being from his home town – with a view to making one of them his wife. Improbably, one of them writes back. Well, actually, more than one of them writes back, but it’s the letter from Lili that captures his heart. Lili isn’t well either, though her condition is not as perilous as Miklós’. And letter by tentative letter, these two fall in love. Fortunately for Miklós, it’s not easy to exchange photos. Emaciated and scrawny, he lost all his teeth when he was beaten up during the war, and the cash-strapped relief services have replaced them with metal ones. His face is disfigured by warts. Both Lili and Miklós have unprepossessing cast-off clothes and even if either of them had any money, the authorities aren’t about to let them travel across the country to meet up in person anyway. Miklós is a scallywag who is determined to have his own way, but Lili has friends who warn her against him because she knows nothing about him. From the beginning of the book, the reader knows that it all works out in the end – it’s the emotional and literal journey that engages the mind and the heart. The passion that Miklós and Lili feel is more than for love, it’s a passion to find a way to be happy again, and negotiating the memories of their war years is no easy task. In addition to the bureaucratic obstacles, and the ominous state of Miklós’ health, there are also betrayals and false friendships, because human nature doesn’t change just because people have been victims. But there is laughter, song and poetry, all driven by the power of the human will. Stu at Winston’s Dad tells me that Péter Gárdos is a well-known film maker. This is his first novel, and you can see the trailer for the film at this link. The book cover design is by the inimitable W.H. Chong. Review copy courtesy of Text Publishing. Miklós has TB, and has to take his temperature all the time. He’s always feverish at dawn, but his temperature settles as the day wears on. But (In English anyway) it’s also a play on words, because he’s feverish with love at the dawn of his new life. Ah, Romaine Gary! I will read him soon, I promise! I was a bit worried at the beginning because I’m not sure I could read love letters between my own parents. But the book sounds interesting. I had a friend at school whose mother, a refugee from Yugoslavia, would tell us stories of how she and her husband met through the fences of their adjacent post-war internment camps. Yes, there comes a time when it’s best to throw them out, I think…But I’m always fascinated to learn how couples met, especially since they often remember things differently. This sounds like a fascinating read, I saw it mentioned recently in an article and thought I must look out for it. Love the review, you’ve really captured the essence of the story and its many aspects, that insight regarding ‘humanity doesn’t change just because people have been victims’ – don’t we so wish the reverse could be true. This sounds rather wonderful, Lisa. Am always intrigued by books that examine what happened immediately after the war ended: have read quite a bit of Canadian fiction that does just that. We were only talking (in the pub) last night about the liberation of Belsen and how that was not the end, but the beginning of a whole other (horrific) chapter.